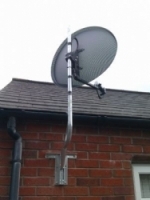 If your having trouble getting your sky system installed we can survey home and garden for a suitable dish site and install your dish when sky wont. 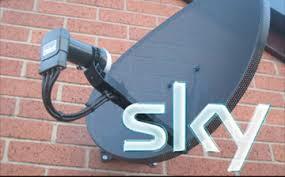 Frequently were called upon to install sky systems that sky themselves are not prepared to do, we will offer a wide range of alternatives such as a chimney installation or a dish sited on your garden fence, with permission from a kind neighbour a dish sited next door or even shared dish. Were here with solutions. 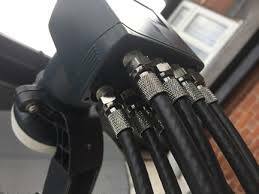 Cabling can be a common issue in a standard sky installation, Arbroath Aerials can route your cabling where is wont be seen with routing through lofts, under floors and in wall cavities, we can offer a number of different routes and you can decide which is best for you. 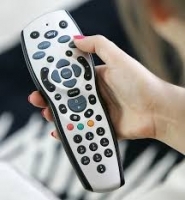 If your having no satellite signal displayed on your TV or picture freeze the most common cause is your dish is needing aligned. 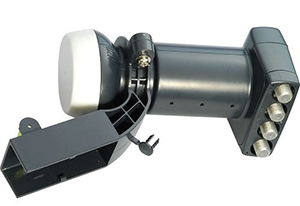 Other causes include bad joints or connections in the cable, damaged cabling, damaged or faulty LNB, a faulty sky box or a poorly sited dish. With a few tests we can diagnose your faults and repair your system. Special heights and high roof work undertaken, if your having problems with your installation we can help. Dish alignments, servicing and sky repairs. Discreet cabling and cavity work (hide in walls). 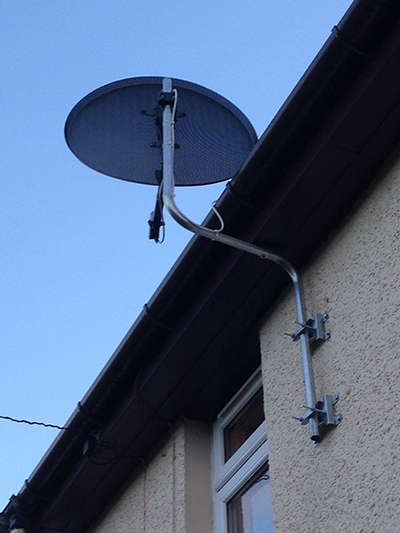 Zone 2 dishes supplied and installed. 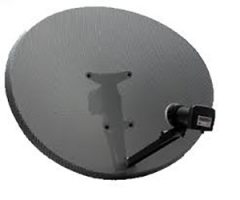 A digital satellite meter is used for all dish installations and alignments. 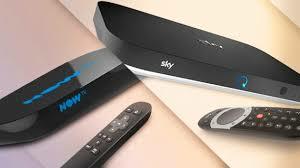 Sky distributing to multiple rooms with or without remote channel changing. We charge £35 for the first half hour and £35 per hour for 1 person after the first half hour if 2 persons are needed an additional £15 per hour for the second man. Fantastic service, was very happy with the service and couldn’t believe how quick it was installed. Would recommend to anyone who needs an aerial installed. Great service so helpful and friendly would recommend to family and friends. Had a great deal of problems getting the sky dish installed onto our building especially due to restrictions on the building and busy body neighbours. Pete & co were great and so helpful, nothing was a problem. They did a brilliant job at a reasonable price and would recommend them to everyone. Will use them again.